The Renewable Heat Incentive is not just for single domestic installations, it is also available as a Commercial Renewable Heat Incentive. 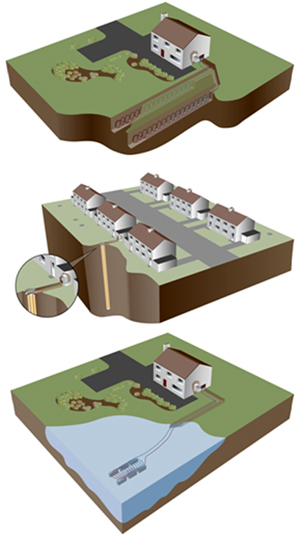 Installing ground source heat pumps in your properties can provide the landlord or social housing group with an effective way to reduce the environmental impact of your homes, create warm, comfortable environments and to gain an additional revenue stream from your properties through the commercial Renewable Heat Incentive. First and foremost is access to the non-domestic renewable heat incentive. Despite the heat pumps being used for heating domestic properties, ground source heat pumps that are installed by landlords and social housing will qualify for the non-domestic renewable heat incentive. This incentive is generous and index linked for 20 years. There will never be a better time to install a ground source heat pump. Additionally, flats or smaller houses can be heated using small heat pumps (3kW) on a district heating system. This keeps groundworks to a minimum and ensures that any potentially disruptive works are restricted to a single area. In addition, the energy usage for each unit can be metered individually so that residents will only pay for the heat that they use. Low heating costs. With a good design, a ground source heat pump can achieve a coefficient of performance of 4. Essentially this means that only one unit of electricity is utilised to produce four units of heat. As such they can be 400% efficient. This may decrease to 200-300% depending upon the heating system they will be working with and if hot water is required. Go Green with a heat pump. Heat pumps are a renewable environmentally friendly technology, but they do require electricity. Why not generate your own solar energy to run it? If you’re a landlord or social housing enterprise looking at ground source heat pumps to provide clean and cost effective heat for your tenants then please contact us via the Contact Page, phone on 01454 324807 or email contact@greenleafinnovations.co.uk We look forward to talking to you.